Next time you host a big party, you NEED to make this punch! It really is THE BEST party punch, it’s so good! 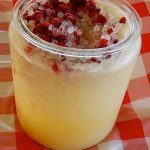 Welcome: Tiffany who blogs at the Would-Be Writers Guild here to share the BEST party punch recipe. She is a freelance writer, wife, mama, kitchen dancer, and carb enthusiast. Her writing will make you laugh, cry and want to master the web cam self portrait. First of all, Happy Blog Birthday to one of my favorites! Kami does a fabulous job of presenting ingenious ideas in a way that seems accessible to everyone. You know, like it’s nobiggie. From watermelon stars to glitter toes to owls-are-the-new-rooster, there’s always something great to learn here…but, you already know that! 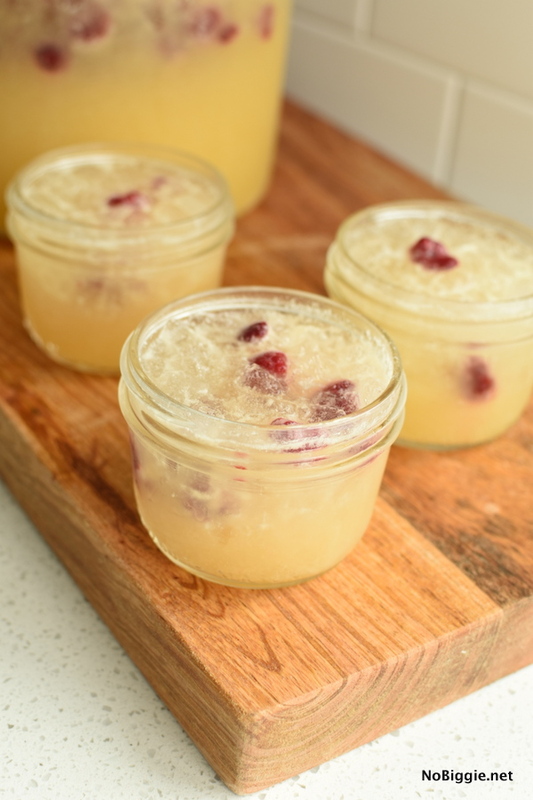 I’m thrilled to guest post today for Kami and share a favorite punch recipe I developed in my special Punch Laboratory (sometimes called my kitchen). The key to this punch is the pebble ice, so it will be worth your while to track some down. The other ingredients you can play around with and substitute if you can’t find exactly what it calls for. The Best Party Punch refreshing and delicious. Don't forget "the good ice"! 4 liters Diet lemon-lime soda That’s two 2-liters for the mathematically challenged. 1 bag pebble ice You can buy it at Sonic Drive-In or at most grocery stores in the deli or meat department. Pour the thawed concentrates into your punch bowl and stir. Use one of the empty cans and fill it with water four times and add it to the mixture. Stir. Next, add about half your bag of pebble ice. 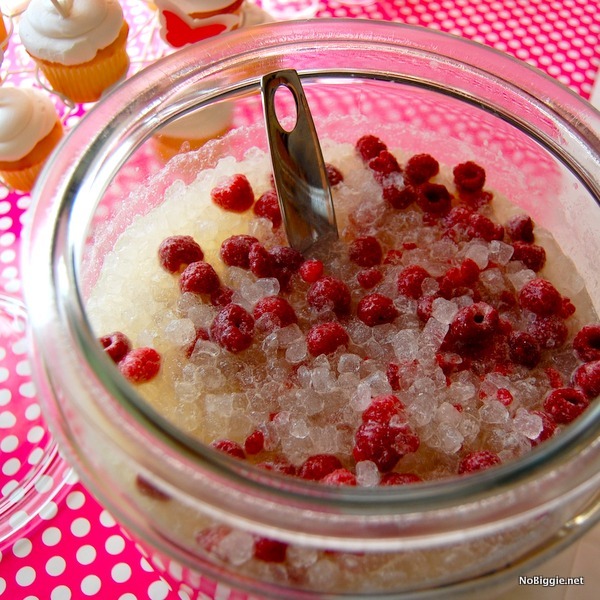 Add your frozen raspberries to the top. Stir, serve and enjoy! NOTE: Please do not insult The Punch by using crappy ice cubes from your freezer. The Punch will hate you forever. ANOTHER NOTE: Adding the ice before the soda will get an ugly foam at the top of your punch bowl. Make sure to stick to the order of ingredients as directed. Congratulations! 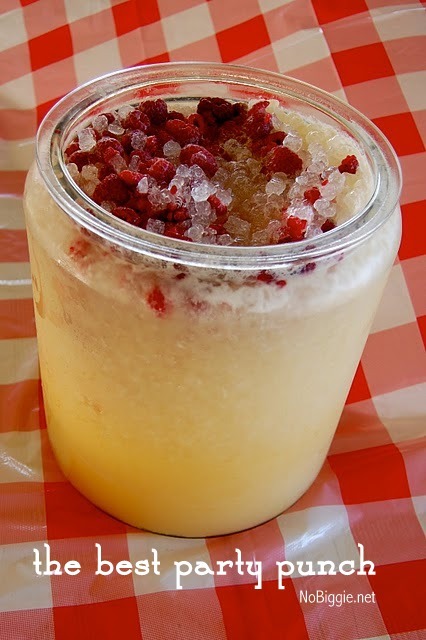 You have just created the Mona Lisa of Punch! Your punch should be a lovely dark yellow at the bottom of your punch bowl, light lemony yellow in middle, almost white on the top, and then bright magenta on the very, very top! So pretty! When you start serving the punch with a ladle, it all mixes together and becomes this dreamy pink color. Then, when you lift the punch bowl to your lips when it is almost gone to swallow the last few drops of punch, it is an even darker pink because the raspberries have really mixed in. When you pass out on the floor because you tipped the punch bowl too far and lost your balance, falling backward to the floor with the punch bowl hitting you square in the jaw, you will see lots of lovely yellow stars and magenta raspberries floating above your head. Beautiful! 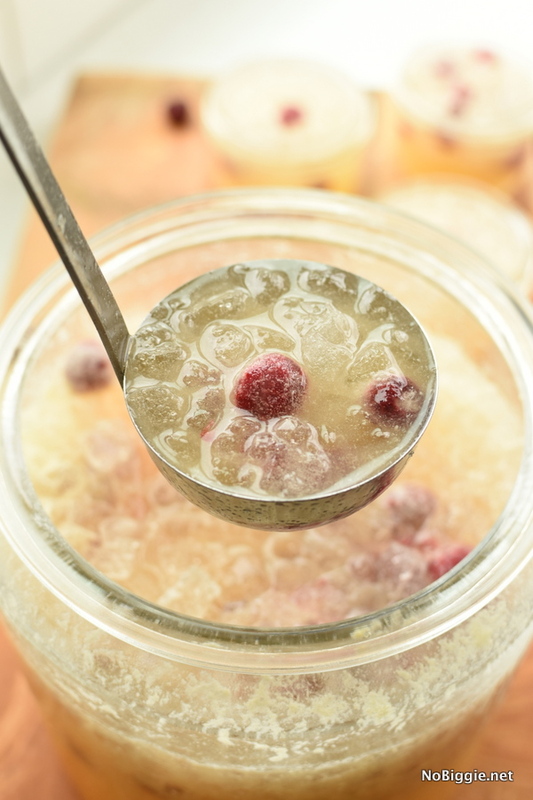 One more note—you can find this classic glass jar to serve the punch here. It comes in three different sizes. 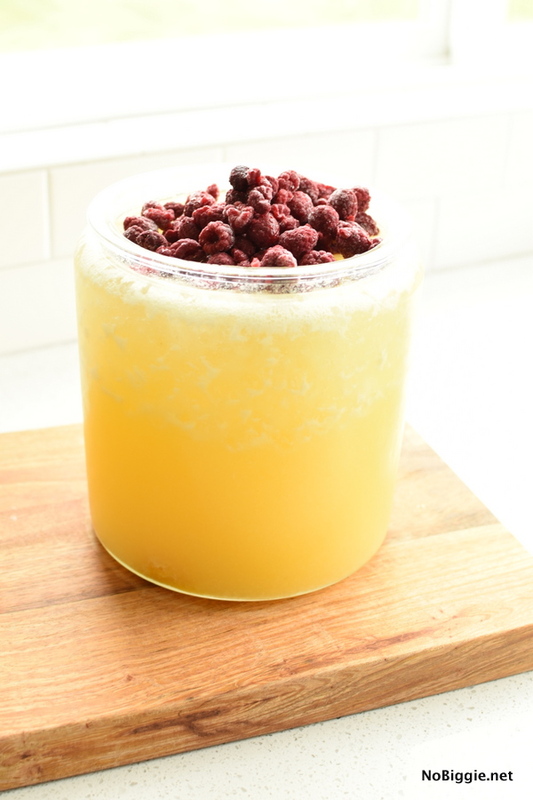 We like the big 2 gallon jar for serving a crowd. If you would like to cut this recipe in half we like to serve it in the 1 gallon glass jar. You can also find this style of jar at Target or Walmart, usually on the bottom shelf in the housewares department. It comes with a lid and will cost you about $12. One more note. If you would like to add alcohol to this punch one reader suggested Malibu rum to compliment the pina colada concentrate. Although she mentioned it would make this punch “sneaky”…the kind where you have a couple of glasses and then your’e feeling pretty buzzed. If you want to avoid the “sneaky” effect go with an unflavored vodka or rum. If you follow the recipe amounts listed, she suggested a quart of Rum.